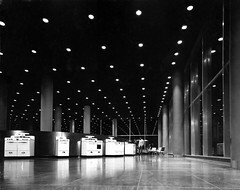 First floor display area at night. For the moment, I'm posting an excerpt from an email exchange related to the Magic Chef Building (as well as Armstrong's Normandy Theatre). I've been going through 1955 newspapers that may be of interest to you. An item in the 1/2/55 Globe saying that Max and Ella Gale took title to the old Normandy Theatre; previous owner was Adele Garthoeffner. In the Post on 3/20/55 announced the old theatre being remodeled into a Gale's store...men & boys clothing. Ben Shapiro of the firm Shapiro & Teasdale designing the conversion. This article includes a illustration of the plans and details, in words, the changes to be made to convert into retail. If Shapiro & Teasdale still exists, there would be a lead to follow. And, in an item in the 2/5/55 Globe saying that Magic Chef put the ad building on the market, asking $1.2-million. Article also said the company lost $1.4-million the first half of 1954 and the work force has been cut to 600. A few days ago I mentioned the Magic Chef building to an acquaintance--and got a somewhat negative reaction. I asked for specifics and was told the elevators were extremely slow and that the first floor display area was cold and drafty. Being about the same age as I, I asked why he was in building...he couldn't remember. If I run across anything else, I'll let you know. thanks for the info. i appreciate your checking on these newspaper clippings. coincidentally, i'm working on a renovation and addition to a home designed by Ben Shapiro of Teasdale & Shapiro. i've checked on the firm and came up with a few anecdotal comments, but nothing substantive. i don't think the renovations done to convert the Normandy Theatre into a retail space are terribly critical to my research, except perhaps insofar as they can confirm (or refute) that Harris Armstrong was indeed the theatre's original architect. thanks very much for the interesting information on Magic Chef. it suggests that the downturn in their business was related to market pressures (as has been mentioned by others). there was apparently very optimistic plans for expansion among many companies manufacturing products for homes. Most of these firms did well in the first five to ten years following the end of WWII. apparently, they believed the tremendous increase in sales during those years would continue all the way through the 1950s. unfortunately for Magic Chef, the gas stoves they produced in that era were so well made that some are still operating just fine 50 years later. i believe appliance manufacturers may have flooded the market, reaped rewards, then when the market became saturated, were stuck in a mode of overproduction. i'm not sure if this applies to other appliance companies, but it would be interesting to know if this was an industry-wide problem or something more specific to Magic Chef. about the building being drafty at the first floor level, i suspect the HVAC design assumptions weren't adequate for this new building type. the primary use of the ground level for display with floor to ceiling glazed curtain walls on three sides certainly made for very dramatic views (from the street as well as from the interior). at that time, curtain walls were a relatively new product and many installations from that era have had to be removed and replaced due to moisture and air leakage. so barring evidence to the contrary, i'm not prepared to attribute Magic Chef's financial crisis to the building's design and/or cost. perhaps someone has written about the relationship between these issues. business journals from that time period would've likely commented on such things. i imagine someone, somewhere has written about the history of consumer products for the home (and specifically appliance manufacturers) in the post war environment. i believe a primary emphasis in sales, marketing, and planning at the time was toward selling modern up-to-date equipment, fixtures, and design. this assumption ultimately didn't hold true for the design of single family homes (on a mass market basis). however, modern architecture did become the accepted standard for commercial, industrial, institutional, public, multi-family housing, and many other building types. i'm always interested to hear people's reactions to Armstrong's work, whether positive, negative, or otherwise.